This page provides access to all the key documents that relate to the DP Business & Management course and will help you prepare for the exam. 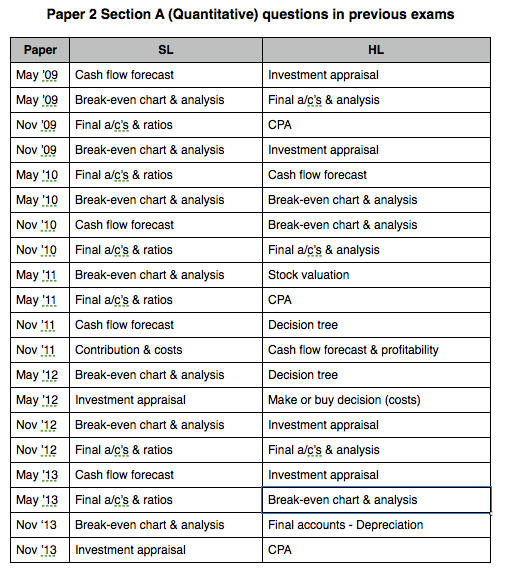 The table below shows the nature of quantitative questions asked in all Paper 2 exams since 2009. It is important that you can define key terms from the guide. The following documents contain all the key terms. You just need to add detailed definitions. Remember to PEE (Point, Explain, Example) in the exam itself, and refer to the stimulus material in the exam question!